Tiffany White hopes to hire as many as six employees for a natural skin and nail care studio scheduled to open in Hyde Park in November. For a decade, Tiffany White worked as an executive assistant in Dorchester, living paycheck to paycheck to support herself and her son. 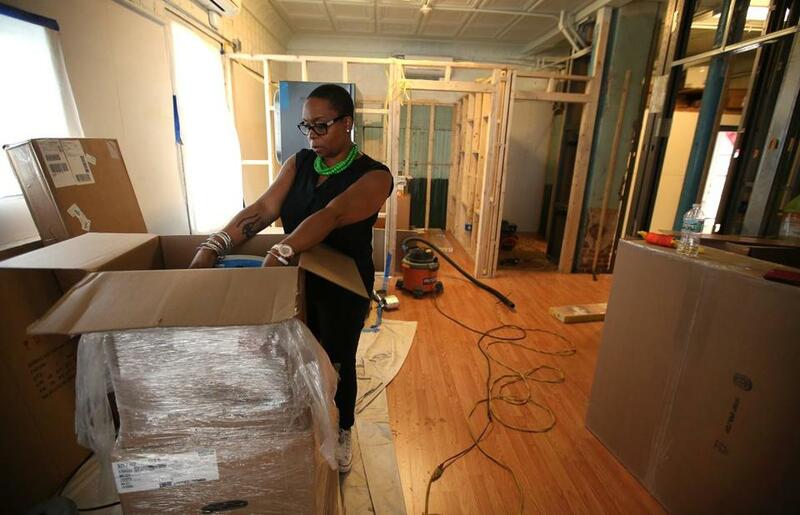 But now she is on the other side of the corporate divide, the owner of a new business looking to hire as many as six employees for a natural skin and nail care studio scheduled to open in Hyde Park in November. 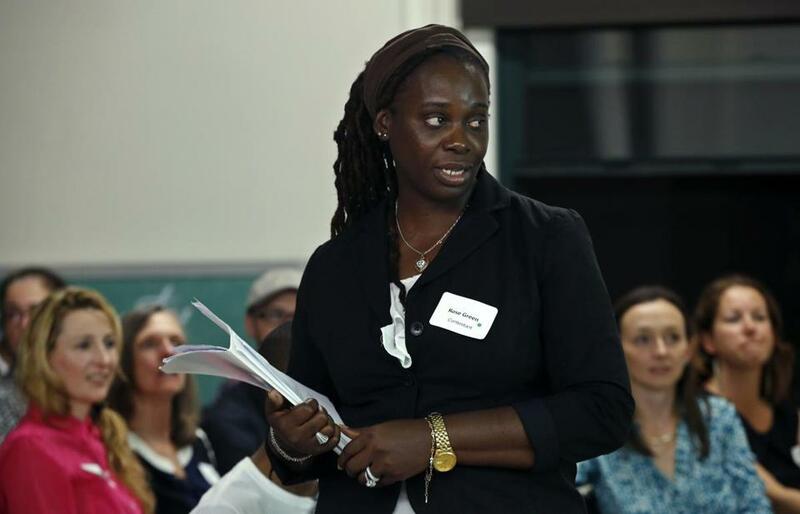 White, 46, credits her leap to becoming a business owner to a free 12-week entrepreneurship program aimed at residents of Dorchester, Roxbury, and Mattapan. The program White attended in 2013, offered by the community development nonprofit Local Initiatives Support Corp., is among a growing number of resources aimed at lower-income entrepreneurs. As the economy improves, starting a business is increasingly seen as a way for people without a lot of assets to work their way into the middle class — driven by intense interest from entrepreneurs as well as investors who want their money to have a social impact. The nonprofit microlender Grameen America has loaned more than $2.3 million to nearly 1,000 women since it opened a branch in Boston last year. A new business division of Northeast Legal Aid has given free legal assistance to more than 40 entrepreneurs in Lynn and Lawrence in the past year. And in Boston neighborhoods such as Uphams Corner, Dudley Square, and Grove Hall, several business incubators have recently opened their doors. The city of Boston is also providing more assistance for cash-strapped entrepreneurs, employing a Harvard fellow to identify the challenges facing immigrant business owners and doubling funding for the free consulting services it provides to small-business owners, the majority of them minority owned. “If you are ever going to deal successfully with income inequality and economic immobility, if you’re ever going to create a more level playing field for people who lack capital, who lack resources, who lack training, then entrepreneurship is a good place to put resources to work,” said Steve Grossman, chief executive at Initiative for a Competitive Inner City , a nonprofit research organization in Boston. 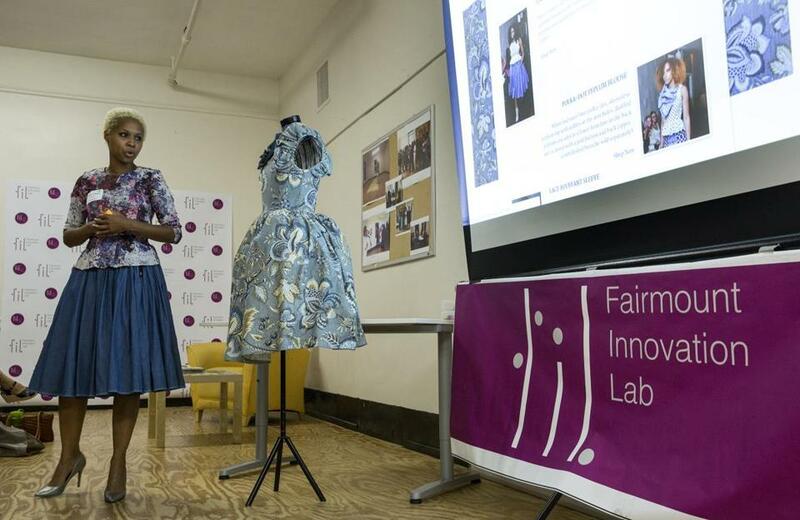 Joelle Jean-Fontaine, a fashion designer with Haitian roots, recently won a $500 prize from the Fairmount Innovation Lab. Starting a business is inherently risky. About half of all new companies fail within the first five years, according to the US Bureau of Labor Statistics. And for low-income entrepreneurs, the challenges are even greater. Many have low credit scores and limited business assets to use as collateral, forcing them to turn to higher-interest lenders for loans. They also tend to have weaker support networks and fewer resources to help them navigate the intricacies of running a business. “There is a risk because people are closer to the margin to begin with,” said Jared Nicholson, who started the service at Northeast Legal Aid that offers legal advice to people who want to start or grow a business but can’t afford an attorney. One of Nicholson’s clients, Maria Acevedo, makes $35,000 a year as a bus driver and certified nursing assistant in Lawrence. Acevedo and her fiancée, who works at a laundromat, turned to Nicholson to set up a side business delivering appliances. With free legal guidance to register the company and review contracts with manufacturers, the couple is hoping to begin deliveries to the homes of Sears and Walmart customers in October. “I call him for almost everything,” Acevedo said of Nicholson. Despite the philanthropically minded investors helping fuel the movement, mainstream investors are not exactly lining up to fund the next big thing in lower-income communities. Smarter in the City, a high-tech startup business accelerator in Dudley Square, struggled to attract funders before it was launched last summer. The accelerator has since gotten more attention, but securing capital is still a challenge, founder Gilad Rosenzweig said. Budding entrepreneur Rose Green told the Fairmount Innovation Lab panel that her business, Dare 2 Dream, a track club in Jamaica, aims to aid women. “People aren’t coming down here actively looking for companies to invest in,” he said. But the demand from entrepreneurs is soaring, according to nonprofit microlenders who specialize in loans to the low- and moderate-income community. Community Capital of Vermont has tripled its lending over the past two years. Accion increased its funding in Greater Boston by 60 percent between 2013 and 2014, and continues to grow. One of Accion’s recent clients is Tia Jackson, a Hyde Park resident who borrowed $5,000 to move her cake and pastry business out of her home and into CommonWealth Kitchen in Dorchester, a shared workspace for local food businesses. Since moving into the workspace, Jackson said she has been able to churn out more red velvet cupcakes and attract new corporate clients. Among other new incubators: the Fairmount Innovation Lab, which supports businesses and entrepreneurs along the Fairmount commuter rail line that runs through Hyde Park and Dorchester. 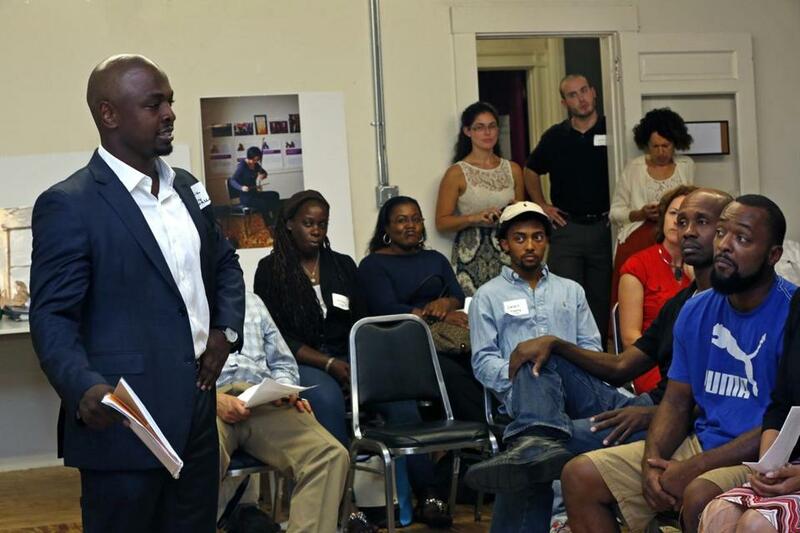 On a recent rainy September night, hopeful entrepreneurs gathered in a room with plywood floors to pitch their fledgling businesses. The $500 prize, which also includes free lab space and help writing a business plan, went to Joelle Jean-Fontaine, a fashion designer with Haitian roots whose mother sews her clothes. It’s a far cry from the $100,000 prizes handed out across town by the startup accelerator giant MassChallenge, pitch contest judge Bob Van Meter said, but it’s a start. Domonique Dennis answered the judges’ questions after a presentation at the innovation lab.